Resetter Canon G1000, G2000, G3000 Driver Download & Service Tool V4720 - For those of you who are interested to get the trick how to resolve or reset G series canon printer, as well as get the software then read on the article until finished. As the printer in general canon printer G series has also been in the settings of the manufacturer that the printer is given limitation counter (limit print), if the print limit has been maximum then the printer will experience Blink automatically with indicators on the screen in the display code ' ERROR 5B00 '. 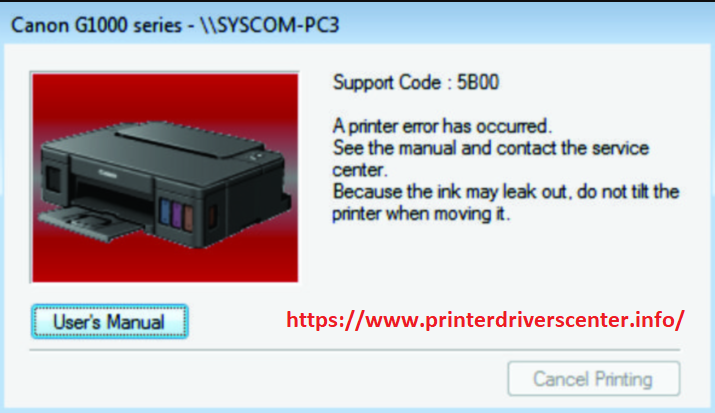 If you are a G1000, G2000, G3000 and printer when you use to print a document file and then suddenly the printer is jammed with the blink printer indicator and the monitor display shows 'ERROR 5B00' then it is certain that your COUNTER has run out max limit print. If it's like that, How can I fix it? Did you question? if so my direct course will explain, if your printer experience problems like what I have described as above, then the solution of the problem is we have to restore the Counter / Eeprom setting to ZERO setting (0). How to? ie by way of our 'RESET USING SOFTWARE SERVICE TOOL V4720'. Steps RESET printer G1000, G2000, and G3000 with 'Service tool V4720'. After Application open please 'Click Settings' section 'Absorber' as shown below once and the led alarm will usually respond with one blink. Turn off your printer by pressing the power button, followed by disconnecting the printer power cable and USB cable wait for about 30 seconds, then plug the cable again.